Wimbledon 2013 started on 24th of June 2013 and will be played till 7th of July 2013. It is the biggest Grand Slam of the world. Even the ones, who don’t follow Tennis, wait for Wimbledon. It is the one Tennis tournament that gives a wide recognition to the Tennis players. Understanding the Wimbledon fervor, we decided to predict today’s match: Bob Bryan & Mike Bryan Vs Ivan Dodig & Marcelo Melo. It is the Gentlemen’s Doubles Final! This is match is predicted using the principles of Numerology. Bob Bryan and Mike Bryan are twin brothers playing in one team. On the other hand, Ivan Dodig and Marcelo Melo are playing in the second team. It is the Final Match of Wimbledon 2013 and the excitement doubles up when two twin brothers are playing at one side. Bob Bryan plays from left hand and Mike Bryan is a right handy. On the other hand, Ivan Dodig and Marcelo Melo both plays by right hand. Bob Bryan and Mike Bryan are American Tennis players born on 29th of April 1978. In the other team, Ivan Dodig from Croatia is born on 2nd January 1985 and Marcelo Melo from Brazil was born on 23rd of September 1983. If we take their Moolank into consideration, both teams seem to be equally strong enough to tie the match. 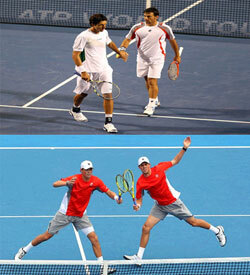 However, if we consider their Sampoornank, the team of brothers Bob Bryan and Mike Bryan seems to be winning the show. So, we will conclude that this Gentlemen’s Doubles Final Match of Wimbledon 2013 will be won by Bob Bryan & Mike Bryan!